Service on the Union-Pearson Express has once again been suspended as bone-chilling cold temperatures continue to cause problems for transit services. 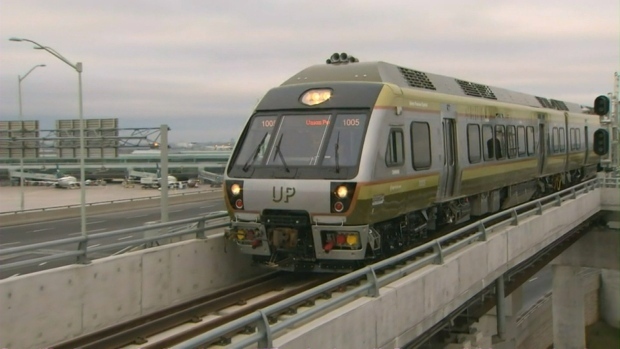 Trains on the Union-Pearson Express will stop running at 9 p.m. tonight due to weather-related problems, the service said Thursday night. Buses will be running between Union and Pearson and between Weston and Pearson instead. Service was suspended Wednesday night and for much of Thursday as well. Service on the line resumed this morning but was suspended again at around 8 a.m. due to the extreme cold and shuttle buses were put in place. Service began running again at 12:30 p.m. on a limited basis, with trains running every 30 minutes instead of every 15 minutes. Metrolinx spokesperson Matt Llewellyn said the "fine, sugary snow" on the ground is mainly to blame for the issues. "It seems to get into every crease and crack into the actual UP unit and when it is whipped up by the wind, that's when it really creates problems," Llewellyn said. Metrolinx encouraged customers to use GO Transit or the TTC to get to work. In addition to the problems with the UP Express, weather-related problems are also continuing to plague the TTC. For the fourth consecutive day, trains are not running on the Scarborough RT. Train service was shut down on Line 3 shortly before the evening commute on Monday and mechanical issues as well as weather-related problems on the tracks have prevented the TTC from restoring service. Shuttle buses are running along the line. TTC spokesperson Stuart Green said crews worked "long and hard through brutally cold conditions" on Wednesday night to get Line 3 running but despite their efforts, service has not yet resumed. "Shuttle buses will run until the full line is clear for service," Green wrote in a tweet Thursday. TTC customers in Scarborough who spoke to CP24 expressed their frustration over the situation. "It’s awful. The wait time to get my son to an exam and my daughter to school is just unbelievable," one woman said at Kennedy Station Thursday. An extreme cold warning remains in effect today in Toronto, which saw wind chill values near -36 this morning. The weather is expected to improve over the weekend when milder air arrives.